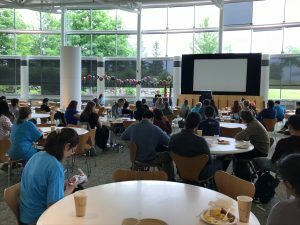 The overarching topic for the third annual Ann Arbor Health Hacks weekend, held June 22-24 2018 was ‘Making do: health in low resource settings’ with a special track on transition into independence for young people with disabilities. 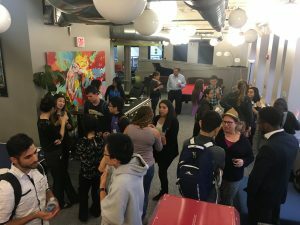 Out of 105 accepted applicants and 49 mentors, and sponsors, 52 gathered for the Friday night opening social at the offices of LLamasoft in downtown Ann Arbor for drinks and snacks and a brief introduction of the organization and event. 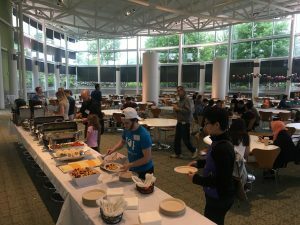 The main event kicked off Saturday Morning to a full auditorium of 97 attendees and mentors at the University of Michigan North Campus Research Complex (NCRC) with breakfast and keynotes. 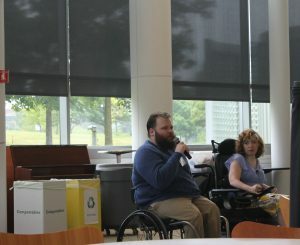 Alex Gossage, interim director and Anna Dusbiber, youth program manager from the Center for Independent Living (CIL) spoke about their respective roles as well as aspects of independence, giving examples of unmet needs and challenges to independence in accessible living spaces, transportation, accommodation equipment (think wheelchairs, etc.) and support services. 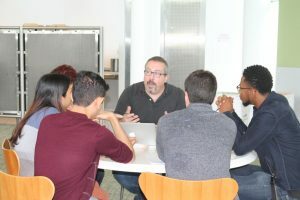 Daniel Dugan from e-Nable spoke about hacking and making, collaborative learning and being unafraid to experiment and fail while in a safe space at the hackathon. 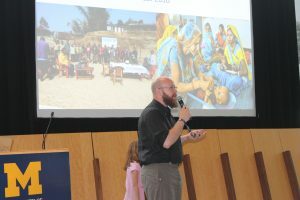 He illustrated his points with some of his own hacks and prototypes –including a low-cost 3-D printed hand prosthesis- that his daughter passed around the room. 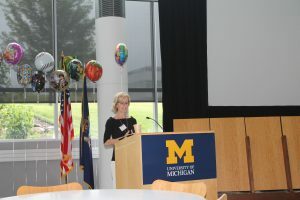 The third and last keynote was by Penny Canada a patient advocate, sharing her experience working with and advocating on behalf of many families with special needs as well as sharing her own perspective as the mother of a college-aged son with health challenges. She passionately encouraged everyone to find their passion or goal and follow them, how surprising or unrealistic they may seem at first, sharing the story of a client who wanted to learn how to water-ski and was able to find help and physical accommodations to fulfill this dream. 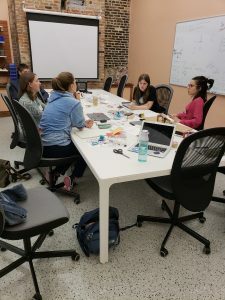 Inspired by the keynotes or armed with a problem they had identified prior to the hackathon, participants pitched a total of 34 specific problems they’d like to form a team around and tackle in the course of the weekend. 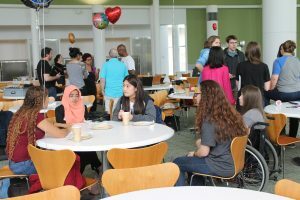 Each picked a balloon to help others locate them during the subsequent mix and mingle period. 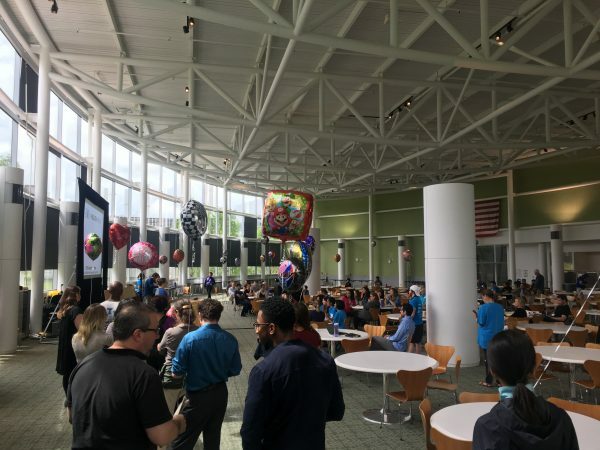 Problems ranged from wheelchair accessible transportation, to cool/ fashionable wearable technology to a web of providers to increase service reliability. 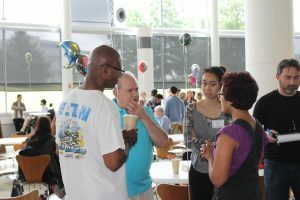 The following unstructured networking had participants walk around, learn about each other’s pitched problems and potential solution approaches. 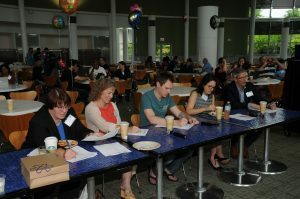 17 teams formed and announced the challenge they decided to work on for the next 24 hours at as lunch was served. 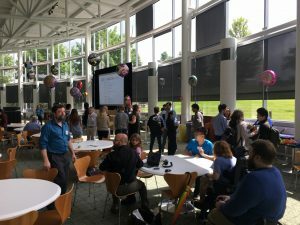 Teams spread out across the atrium as well as adjacent conference rooms and corridors as well as to the satellite location at the new Tinkertech makerspace in Ypsilanti to prototype their solutions as 36 mentors in IT, engineering, healthcare and business came through to help them brainstorm and prototype. 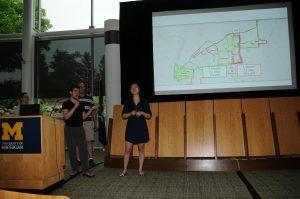 The judges had no easy task deciding and awarded the low resources first prize to Counterfit, an app that uses a cell phone’s light for spectroscopy to verify the molecular identity of a drug at the point of sale. Think verifying a Malaria drug is not counterfeit at point of purchase in rural Nigeria. 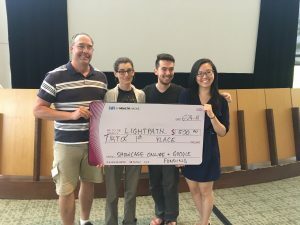 The TIKTOC first prize went to Lightpath, an app that crowd sources light data from cell-phone sensors while driving to suggest a well-lit route alternative for people driving with night blindness. 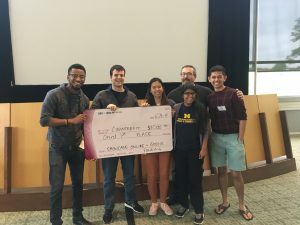 Besides prize money towards their prototypes, both first prizes also won participation in the Fall Entrepreneurship Bootcamp with Ann Arbor SPARK. 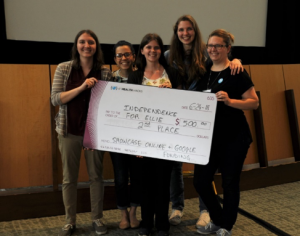 And the second prize, $500 went to Independence for Ellie: a device that allows a young child to independently determine when to feed herself through her feeding tube as well as how much and how fast. 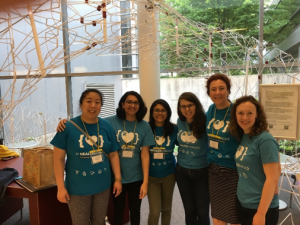 An exhausted yet excited A2H2 leadership team would like to thank all sponsors, judges, mentors, volunteers and participants for their support and enthusiasm making this third annual Ann Arbor Health Hacks weekend such a success! We encourage all teams –not just the winners- to stay in touch with us and share project updates. 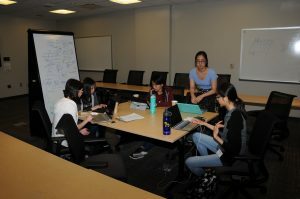 Get involved and shape A2H2’19!! Thank you, we look forward to seeing you at future events!